More than 25,000 fighters have joined forces into a single terrorist group that fights in at least four Syrian provinces, the chief of Russian General Staff Main Intelligence Directorate said Friday. KUBINKA (Moscow Region), (Sputnik) — The militants from ex-Nusra Front play the key role in the new formation, Col. Gen. Igor Korobov said at an Army-2017 forum roundtable. "At present, more than 70 band formations, including from the ranks of the opposition which used to consider itself moderate, have joined together. The total strength of the Hayat Tahrir Sham group exceeds 25,000 militants," he said. The group engages in active hostilities against the Syrian government forces and moderate opposition in the provinces of Aleppo, Damascus, Idlib and Hama, Korobov noted. Meanwhile, Korobov said that around 9,000 terrorists from the Jabhat Fateh al-Sham (formerly known as Nusra Front) terrorist group were attempting to take control over the Syrian province. 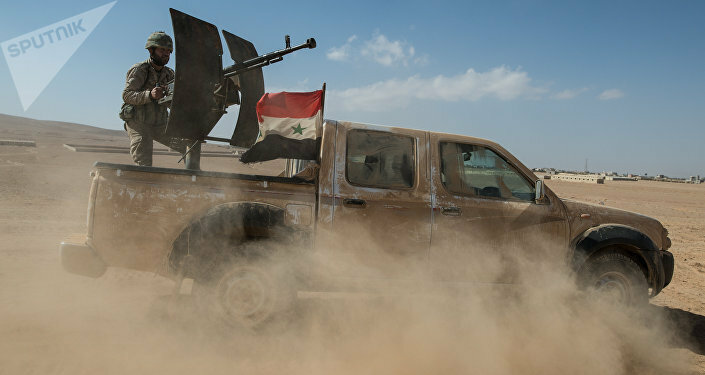 The armed conflict in Syria has lasted since March 2011, with government forces loyal to Syrian President Bashar Assad fighting numerous opposition factions and extremist groups operating in the country.